Although the release of To the Wonder comes a mere nineteen months after The Tree of Life (2011), the arrival of a new Terrence Malick film continues to feel like a rare and precious event. This film is a mournful exploration of love, a tone poem on romance and loss and, like other recent ambitious cinematic efforts (Holy Motors, Killing Them Softly, Cloud Atlas), it will prove to be a polarising film. Those who find Malick’s style unengaging may discover little of interest here; even those who don’t may find it rambling and repetitive, or even question the director’s integrity. However, there is great beauty and feeling to be unearthed in this film. It starts optimistically enough: we see two beautiful people in love, visiting Mont Saint-Michel and the beaches of Normandy. But their smiles and loving glances mask some serious relationship issues, ones they are unable to vocalise. After moving to America, their romance dwindles and Marina (Olga Kurylenko) returns to Paris with her daughter. 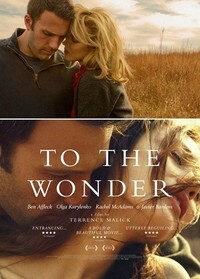 Neil (Ben Affleck) begins a relationship with Jane (Rachel McAdams), an old friend. A local priest (Javier Bardem) is also questioning his station in the world. Affleck may lack the expressive qualities of other Malick leads (Sean Penn, Christian Bale), but this (just about) works to his benefit, feeding into the retentive nature of his character. As with Jessica Chastain in The Tree of Life, Kurylenko is the heart of the film, and her sorrowful, undulating performance proves how her talents have been wasted in blockbusters such as Max Payne (2008) and Quantum of Solace (2008), expertly expressing the ambiguous duality that flows through her character. Marina provides an outsider’s perspective of America, her voiceover sharing the naïveté of Malick’s earlier female protagonists; during her moments of joy, she behaves like Pocahontas (Q’orianka Kilcher) in The New World (2005), childlike in her whimsy but exploring different environments, bouncing on beds and dancing through supermarkets. Contrastingly, McAdams represents a more conventional American beauty, her scenes with Affleck blending frontier iconography (horses, buffalo, cornfields) with a more natural, passionate romanticism. But this relationship, too, is patterned by sadness. Communication is conveyed in the film through gesture rather than dialogue; it is compelling to think of the characters’ voiceovers as a series of postcards, sent and received, asking questions without expecting a response. Bursts of happiness are just that, small eruptions in a sea of sorrow rather than the "avalanche of tenderness" that Marina describes. The sections of the film concerning Bardem’s priest, however, are less successful. Suffering a crisis of faith, he maintains a communication with God but is divorced from his congregation. These scenes are noticeably disjunctive, and it is sometimes difficult to work out how this jigsaw fits together. But Malick articulates an interest in the religious along with the spiritual, viewing religion as a form of human rather than divine expression. Re-teaming with cinematographer Emmanuel Lubezki for the third time, Malick again makes evident his gift for shooting in natural light, capturing the ephemerality of feeling, emotion, and love. The rhapsodic classical score complements the beautiful visuals commendably. To the Wonder may serve as a fascinating accompaniment to The Tree of Life, though it is less concerned with the metaphysical or cosmological. Yes, the film is indulgent, but its excesses of style, beauty and expression allow for thematic exploration. Its investigation of romance focuses on the essential themes of communication and commitment, working through issues of faith, trust, loss and human weakness to ask questions about devotion and desire. While the film is imbued with an almost overwhelming sadness, this process of examination is itself somewhat uplifting. To the Wonder is perhaps not as expansive or philosophically enriching as Malick’s more recent films, and it feels like a lesser work by his own high standards. This is, in part, due to its explorative nature, affording an openness and ambivalence that makes the narrative feel less complete. And yet the film stands on its own merits, as a relationship movie that refuses to concede to cliché or trite convention, and one that yields layers of emotional resonance. This review was published on March 04, 2013.